Religious Liberty Exchange. Secretary General of the AIDLR talked at the Supplementary Human Dimension Meeting hosted at the Hofburg Palace in Vienna on 22-23 June 2017 with Ms. Stacy Bernard Davis, Unit Chief for Europe and Eurasia, Office of International Religious Freedom, US Department of State, regarding how to remain vigilant and develop tools to fight the discrimination and intolerance directed against people who belong to religious minorities concerning freedom of religion, expression and assembly. Conversation between the Secretary General of the AIDLR and the Unit Chief for Europe and Eurasia also took place concerning a collaboration between the US Department of State and the AIDLR regarding the future Summit on Religion, Peace and Security proposed to take place as a follow-up of the previous Summit hosted in Geneva. 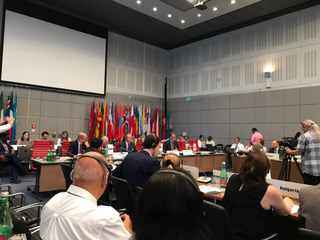 Photo: Dr. Liviu Olteanu delivering his keynote at the OSCE in Vienna. Photo: Dr. Liviu Olteanu with Ms. Stacy Bernard Davis, Unit Chief for Europe and Eurasia, Office of International Religious Freedom, US Department of State and the US Ambassador.